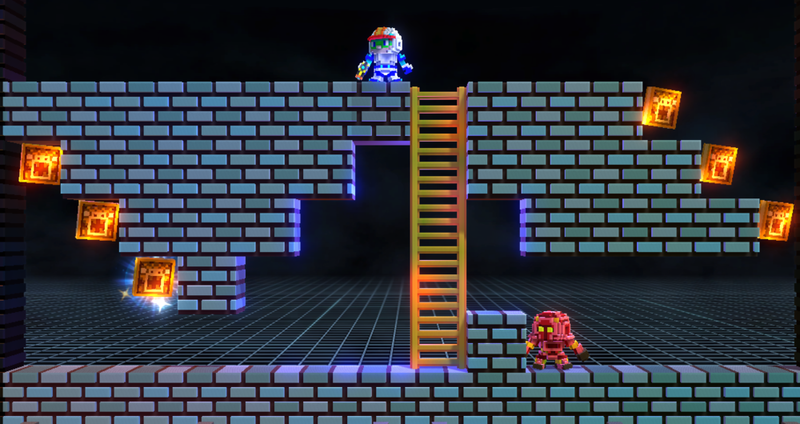 Lode Runner Legacy Review - A Classic Takes A Cue From Mario Maker — GamingWithSwag.com - Dads By Day, Gamers By Night. High Level Premise: It's the classic game Lode Runner, in 3-D! Plus a level, item, and character creator tool. Download what seems like an endless amount of user-created content, or upload your own! Original 150 Lode Runner levels included as well. Music/Soundtrack: Upbeat Techno, not distracting or annoying. Story: Control the Runner to collect all of the gold and avoid the evil Empire. Replay-ability: Near endless, with the level editor and ability to download levels and upload your own. Time Commitment: Minimal, levels take around 5 minutes to complete. Stop whenever you like, your progress is saved after each level. Value: The value is there if you like Lode Runner, level creation, of platform/puzzle games. Favorite Element(s): The ability to create and play levels that users have created around the world is the main draw here. Content is something that Lode Runner Legacy does not lack. I know that I was first exposed to Lode Runner via the Game Boy iteration, Hyper Lode Runner. I might have played Lode Runner on an older PC in the late 1980's at my cousin Tom's house, but I cannot remember. It's an addictive classic platformer that makes you say, "just one more level." The premise is simple, collect the gold and avoid the bad guys. You can remove blocks as needed to accomplish this. There isn't any long drawn out story, cut scenes, and that's okay. Just puzzles, platforming, and strategy. Lode Runner Legacy looks great for the 21st century. Lode Runner Legacy follows this strategy by focusing on gameplay and light on unnecessary fluff. There are 50 adventure levels to complete, as well as 50 puzzle levels (no enemies). There also is the 150 classic levels to complete if you are in a nostalgic mood. Using a controller feels right in Lode Runner Legacy, and would be the preferred way to play. The only real issue I have is the controls in the level editor, they take a little getting used to, especially after playing Super Mario Maker using the touch controls on the Wii U gamepad. Endless possibilities await players when they browse the uploaded levels section of the game. The thing I always liked about Lode Runner is that it's basic in concept but challenging in execution. As someone who grew up on arcade games that had brutal difficulty and were designed to eat quarters (I'm looking at you Gauntlet! ), Lode Runner Legacy is a welcomed addition to my Steam library. The amount of content you get for under $20 is plentiful. I really had a great time playing with the levels that other users have created. It's not for everyone, but if you like puzzlers and retro platformers you should definitely at least check this out when it is on sale.